Our final day of pastoral visiting and pilgrimage began in a most special way: Father Guido arranged for us to celebrate Mass at the Mount of Calvary located in the Basilica of the Holy Sepulchre. It was a cherished moment for me to know that over this very location Our Lord was crucified. There were some pilgrims who joined us for the Mass and it was obvious in their faces how they, too, were so much in awe of the moment. From there, we proceeded to pay a visit to the Papal Nuncio Archbishop Antonio Franco. We enjoyed a very animated discussion with him and he was most cordial in extending to me his best wishes in my new role as President of CNEWA. He shared with us some helpful insights on the complexities of working for the Church in an environment of conflict and tension. He said that after more than six years in Jerusalem, as the Nuncio for Israel and Palestine, he still understands only a little bit of the many problems that are part of daily life here. After that visit, we shifted gears into the pilgrim mode, to visit some holy sites. I was blessed to have Father Guido as my guide along with Tony Zarour from the office as our driver. We visited many sites in about six hours, so I will just mention some of the highlights. First we headed to the Dead Sea, which at 350 meters below sea level is the lowest place on earth. We saw the famous sight of people floating in the salty water. The sea has receded so much, but still maintains its beauty and health-related benefits, as evidenced by the many skin treatment products from there that are sold throughout Israel. From the Dead Sea, we traveled to the Qumran cave. This is where a shepherd in the 1960's found ancient scrolls nestled in earthen jars that had been buried for many centuries. These famous Dead Sea Scrolls opened to the world a first-hand glimpse of life in the ancient Essene community. The geography here is breathtaking: a mountain range which has a dramatic escarpment, the view to the cave itself, and the recently excavated early community with its very sophisticated system of water storage and irrigation. Then it was on to Jericho to visit the oldest city on earth and, like the Dead Sea, a place situated more than 300 meters below sea level. A little gem and a favorite site for Father Guido was next on our pilgrimage: an ancient monastery named for St. George, located in a extremely remote part of the desert, between Jericho and Jerusalem, but down a deep gorge and hidden from view of the nearest road. There are just two monks living there at present and one of them has trained his donkey to go up to the nearest Bedouin village to get milk and bread. Once loaded up, the donkey is sent back down into the steep gorge with the supplies. This is a new concept in home delivery! Then it was on to Dominus Flevit Church, built on the site where Jesus wept over Jerusalem. From this spot, we had a magnificent view across the valley looking to the walled Old City. Gethsemane was our next site, where Jesus spent his time in prayer before being arrested. Here we remembered Jesus and his agony in the garden. Our final stop took us to the Church of St. Peter in Gallicantu, where tradition holds that Jesus was denied by Peter and where he was also imprisoned before his crucifixion. This is a most brief commentary on what was a very intense and memory-laden experience, too much to reflect in these few words. I was so grateful to have seen so much. I know that on successive visits here I will be able to visit more holy places, so I leave fully satisfied. I have been extremely blessed to have experienced so much of the best of the Holy Land. Our day ended with a most uplifting video conference call to everyone in our office in New York. This was the third one during this pastoral visit. I was so excited to share some of my experiences with my staff. And it afforded the staff an opportunity to know much better our local director Sami El-Youssef, who gave a very impassioned reflection of what our visit meant to him, his staff and the people of Palestine and Israel. I have the honor tomorrow (Saturday, December 24) of accompanying the Latin Patriarch to Bethlehem, where it will be my most precious privilege to concelebrate with him at the Midnight Mass at the Basilica of the Nativity built over the site where Jesus was born. You will all be remembered in my prayers during that Mass. Our special intention for the Palestinian people and all the people we have visited will be for a lasting peace. I will share a final post with you after I return home on Monday, December 26. Until then, be blessed in Gods love. Merry Christmas. That expression means so much more to me now. Our first visit today took us to the Aida Refugee Camp in Bethlehem. Pope Benedict visited this camp in 2009 and gave a famous speech in front of the entrance to demonstrate solidarity with the Palestinian people who have suffered so much in the two intifadas, which devastated much of this holy city. Upon entering the camp we were greeted by the director of the Al-Rowwad Center, which offers young people a special creative environment to learn drama, photography, art and other areas of study that encourage them to express what the center calls a “beautiful resistance.” The resistance is not violent in any way but creatively allows the young to learn together how they can express their feelings in a constructive way. They are very proud of having dance and drama troupes that have performed in a number of countries, including the U.S.
As a somewhat serious photographer, I was really impressed with their exposition prints adorning the walls. I was also impressed that they literally take their performing skills “on the road,” in the form of a mobile stage for their performing arts programs. They even use the offensively high and sterile wall put up by the Israeli government as a “screen” for showing movies. We had a walk through the camp and our host pointed out in many places the remnant of bullet holes fired from the military and we could even still see in the street the marks of the tank treads, a reminder of the full occupation by the Israeli military. From this community-based center, we proceeded to a peaceful home for unwanted babies and expectant mothers rejected by families. It’s called the Creche of Bethlehem. What a fitting name. The director of the facility is named Sister Sophie and she is something special. This sister is the embodiment of the protector of little babies and the unwanted. She loves each and every one of the 91 childen cared for at the Creche. CNEWA has offered some help here in the past, but the main source of support comes from the Knights of Malta. God bless them. From Bethlehem, we traveled north of Jerusalem to a rather barren and hilly area about a half-hour out of the city. There we visited an all-Christian village named Taybeh. There are three Christian churches here — Latin Catholic, Melkite Greek Catholic and Greek Orthodox. To arrive here is to arrive in an oasis of peace, beauty and tranquility. The pastor of the Melkite parish was our host and first took us on a tour of his parish facilities, which included some improvements provided by or assisted by CNEWA. CNEWA is now helping to repair a fallen ceiling. The pastor, Father Jack, expressed many times over his profound thanks to all of you for your kindness. A real surprise in the visit was entering the excavated ruins of one of the oldest Byzantine churches in all of Palestine, which dates to the fifth century. The view from this hilltop was magnificent, allowing us to see all the way to Amman, Jordan. This was actually part of the ancient town of Ephraim mentioned in the bible. After our tour, we had lunch with a group of young people from the town who openly and honestly engaged us in a dialogue. They shared with us their frustrations, their dreams, their disappointments and their hopes. I responded that, first and foremost, they had to challenge themselves in their faith and I offered that we cannot give them money to accomplish their dreams but we can offer other forms of assistance such as technical help. But faith is the starting point. I admired them for their honesty, and I think that we gave them a broader view of ways to develop themselves as individuals and as a small Christian community. The final event of the day was a Mass with the staff of our office here in Jerusalem and their family members. Mass was followed by a delectable meal prepared by Tony Za’rour, who is a very accomplished chef. It was delightful to meet the family members and to see how well they related with each other, especially with the many children of Pontifical Mission staff. The staff gave me a beautiful Jerusalem cross pin, which I will proudly wear on my suit jacket. Sami El-Yousef, CNEWA’s Regional Director for Palestine and Israel, has done a tremendous job of hosting us. There is a huge amount of planning and execution that went into all these arrangements. He and his staff have truly been a family to me and I am most grateful. Tomorrow, Father Guido and I will begin our day with an early morning Mass at the site of the Mount of Calvary, and then we will visit the Papal Nuncio. After that, I will have time for a personal mini-pilgrimage with Father Guido. Finally, our day will end with a video conference call with the entire staff in New York, so as to include them in a personal way with my pastoral visit to Palestine. You will all be remembered tomorrow morning at Mass at the site of the death of Our Lord. Our day began with an early morning Mass and then we headed to Bethlehem. This was an exciting drive for me, to know I was about to enter Bethlehem, the place of Our Lord’s birth and only three days away from celebrating Christmas there. Along the way, our host Sami El-Yousef, CNEWA’s Regional Director for Palestine and Israel, showed me some of the demarcation lines between Bethlehem and Jerusalem, how settlements keep encroaching on Palestinian land and little by little the size of the territory earmarked for Palestinian people diminishes. There are walls of concrete that keep Palestinians locked inside one boundary and excluded from entering other boundaries. We arrived in Bethlehem and went straightway to the Ephpheta Institute, a school for the hearing and speech impaired. We were warmly greeted by Sister Carmela de Marco, the superior, along with some other sisters and lay staff. After a chat about the program there and the type of instruction used with the children, we enjoyed a coffee together before beginning our full tour. Of course, the highlight was being with the children, all 125 of them. The very youngest receive wonderful one-on-one training and speech therapy, rendered in a most loving way. After a few years of such intense instruction and training, the children are ready to begin primary school education. It was so edifying to see the progression of the children as they learned first to repeat sounds, then words, then to speak in sentences. The biggest surprise was the upper level kids who were actually bi-lingual, speaking in Arabic and English. I was so proud of each and every one of them. Some of the older kids were doing some work on their computers and were excited to tell us about their studies and their dreams. 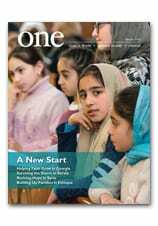 One 10th grade girl very openly said to us: “I would like to come to America.” Another young man said to me: “Can I have the website address so that we can read your blog?” They were excited to hear about the blog and that I would be writing about them in this report. From the Ephpheta Institute, we proceeded to the Pontifical Mission Library, located adjacent to Bethlehem University. He we were welcomed by a group of young married women, who were participating in a regularly scheduled personal and family enrichment session. This was really an impressive group. They offered to share with us the challenges of being a mother, a Palestinian and a Christian. Every one one of them affirmed how important the library has been in their lives. Under the very tranquil and hope-filled direction of administrator Ms. Monnitte Velasco and her great staff, these women were being enriched with instructions in cooking, in family values, self-development through reading, music instruction and many more programs. Father Guido and I felt very uplifted by the testimonials given by each one of them and have a very strong appreciation of the library. As with our library project in Amman, Jordan, I will add that calling it a “library” doesn’t do it justice. It serves so many needs, it is more like a community center and resource for people of every age, including little children. After a lovely lunch prepared by Monnitte and the other young ladies — and after filling our plates several times! — we departed and walked next door to Bethlehem University. Sami worked here for 24 years, in administration, so this visit was a sort of “homecoming” for him and a welcome to Bethlehem University for me. CNEWA was instrumental in the founding of this University, and has maintained membership on the Board of Directors, so my visit was all the more special. Two De La Salle Brothers — Vice Chancellor Brother Peter Bray and Director of Development Brother Jack Curran — were our hosts and led us first on a tour of the facility. It is a beautiful campus with the original building renovated from its origins as a high school. There have been plenty of new buildings in recent times and another major building project is near completion. We even had an opportunity to engage some of the students. They seemed very happy and are thankful for the opportunity, as Palestinians, to seek higher education for a chance to have a better future for themselves and their families. Our hosts made mention that the highest point in all of Bethlehem is the statue of Christ atop the original building on campus. How fitting that Jesus, in the town of his birth, would be the most dominant figure looking over the city and into Palestine and Israel. On another note, the brothers also showed us some bullet holes in their home, left there as a reminder of the Israeli-Palestinian violence that erupted in the fall of 2000. Everywhere, we hear that education is the key to the future of the Palestinians and higher learning is no exception. This university stands as one of only two Catholic universities in all of Palestine. And 70% of the student body is female, which is also a good sign of how this university can make a big difference in the future of Palestine. From the university, we proceeded to visit the Catholic Action Sports Center. This project is housed on a large campus with everything from a gym (the largest and best in all of Palestine) to an outdoor swimming pool, weight training and fitness machine room, meeting and training rooms, outdoor picnic areas, large hall, etc. The Franciscan Custody owns the property and has a great partnership with CNEWA/Pontifical Mission in sponsoring basketball classes and league play. We watched as a group of girls had a session with a very skilled trainer. It is an impressive center and is the only such facility in all of Bethlehem. Another great outreach of CNEWA/Pontifical Mission, thanks to all of you in your generosity! The final visit was to Sami’s house for a superb dinner prepared by his dear wife. The very specials guests included His Beatitude Patriarch Fouad Twal, Auxiliary Bishop William Shomali (whom we had met on our first day in Jerusalem), and Father Emil Salayta, Director of the Ecclesiastical Court. The meal was exquisite and the company superb. The Patriarch was very comfortable and shared with us some important insights into how the Church functions in an environment filled with many complications, conflicts and restrictions. Bishop Shomali also asked many questions about CNEWA/Pontifical Mission and it afforded me an opportunity to present a broader view of the many services we to offer, not just financial grants, but also with technical support and counsel. Our stomachs were full and the hour was getting late, and I still had to write this note to all of you, so we departed. I had also realized that we would be leaving early the next morning for our first trip of the day, to Aida Refugee Camp. So goodbye for now and God bless all of you. The Patriarch sends his best regards along with a blessing. Msgr. Kozar visits Archbishop Mar Swerios Murad, the Syriac Orthodox Archbishop of Jerusalem. After an early morning Mass with Father Guido in a small chapel at the Notre Dame of Jerusalem Center, we walked through the New Gate of the walled Old City and visited with Archbishop Swerios Malki Murad of the Syriac Orthodox Church. After he warmly received us, I extended to him my congratulations on his recent celebration of his 25th anniversary as a priest. He laughed when I said, “I heard you had quite a party,” and shared with me that Sami El-Yousef, our regional director in Jerusalem, had attended this event, too. He was a most engaging host and we enjoyed our exchanges. He also expressed his thanks to CNEWA for the seed monies we had provided for various projects of his community. I especially enjoyed our tour of his complex. He invited us to view with him ongoing excavations under his church and chancery. It was a real treat, as we began our tour in the church and then he unlocked for us a room that according to Syriac Orthodox tradition is the Cenacle Room in which Jesus gathered with his Apostles and mother Mary for the Last Supper. There was a real holiness to this space. Then he led us to another area just discovered and very much in need of excavation that has some precious antiquities. What most impressed me was that he personally took us into this work area and very proudly explained his master plan for all of this restoration and development work. We then proceeded to our appointment with the senior church leader in Jerusalem, Greek Orthodox Patriarch Theophilos III. The patriarchate is rather newly renovated and is a visual gem upon entry, with a magnificent staircase and beautiful receiving rooms. We were escorted into a medium size room that had about 60 chairs neatly arranged. His Beatitude entered and greeted us warmly and immediately offered congratulations to me as the new president of CNEWA and the Pontifical Mission for Palestine. He introduced us to his secretary and, as is the custom in the Holy Land, he summoned his attendants who offered wine for a toast, then coffee or tea and chocolates. We had what turned out to be a rather lengthy and most cordial visit, which lasted over an hour. The patriarch made light of some things and enjoyed some laughs with all of us. We even exchanged some convivial banter about the Catholic/Orthodox differences. I left in friendship, accepting his invitation to return for another visit when next in Jerusalem. We returned to the Pontifical Mission office for a special visit with Dr. Bernard Sabella, who represents the Near East Council of Churches. We partner with this organizing committee in supporting three health care clinics in Gaza. This gentleman, who Pope Benedict XVI invited to participate in last year’s special assembly for the Middle East of the synod of bishops, is a storehouse of knowledge and experience. He is no lightweight nationally and even internationally, as he is a real champion for the cause of Palestinian refugees. Among many insights and shared experiences, he offered thanks to all of you for your support and highlighted Sami’s professionalism, organizational skills and his leadership in the greater Jerusalem community. We followed up this visit with a lunch with Mr. Tony Khasham, Chair of the Coordinating Committee of the many Catholic agencies involved in working with the Palestinians. He, too, is a most interesting and experienced reference. A professional tour operator, president of the local St Vincent de Paul Society of Jerusalem (which by the way was founded in the mid-1800’s) and chair of this coordinating body, he is most knowledgeable in the history of Christian outreach to the Palestinians, what has worked and what has failed. His words were very affirming to me, in terms of the challenges for CNEWA and the Pontifical Mission as we continue to address the needs before us. And, as with so many people in Jerusalem involved in helping the Palestinian people, he had high praise for the work of Sami and his entire staff. From this luncheon we traveled out about 20 minutes to visit one of the high visibility projects in which CNEWA and its Pontifical Mission serves as administrator, a housing program that will eventually house 80 Palestinian families. This is not about giving away free housing. Rather, it is a well-thought-out program sponsored by the Latin Patriarchate to offer seed money and loans to Palestinian families who have been approved as good candidates to purchase these housing units, which will be theirs upon completion of payment of their loans. I was privileged to meet with a group of these soon-to-be homeowners. Even though construction is still in progress and there is no road yet, they are very excited about the dream of having their own “home.” They are most grateful to CNEWA for administering the program and giving them a real future, and one for their children. Rodolf Saadeh from our local office has given his heart and soul to this program as administrator and we are proud of him and the people trust him and love him. I had the privilege of blessing the buildings. Their joy in seeing their future being built before their eyes could not be contained. A number of their children were there, playing on the piles of dirt, wood scraps and stones, but for them it was their new backyard and future picnic area. This is an exciting project and hopefully will serve as a model for other churches and agencies to imitate. The final event of the day was a delectable dinner at the Notre Dame restaurant in the company of three specials guests: Archbishop Youssef Jules el-Zereyi, Melkite Greek Catholic patriarchal vicar; Bishop Boutros Malki, Syriac Catholic patriarchal vicar; and Father Pietro Felet, S.C.J., the secretary of the Assembly of Latin Bishops of Arabia. What a delightful trio. Father Guido, Sami and I really enjoyed our company, had a delightful meal and even better conversation. It sounds trite, but I truly felt as if I had known all three for quite some time, as their gentle manner and refreshing spirit of honesty and humility were very uplifting to the three of us. We came together as strangers and parted company as extended family. Tomorrow we head to Bethlehem for some pastoral visits and end our day with a dinner at Sami’s home. That should be a wonderful family experience, and Sami has also invited some special guests to join us. I’ll tell you more about that tomorrow. May God bless all of you. You are in our prayers and the prayers of the poor. How do you best begin your first full day in the native land of the Lord? How about a beautiful and tranquil early morning liturgy on a stone altar along the shore of the Sea of Galilee? That is how the four of us — Father Guido; Sami El-Yousef, our regional director for Palestine and Israel; his colleague, Tony Za’rour; and I — began our Saturday. Just a few hundred yards from the Church of the Multiplication of the Loaves, we walked past some olive groves and some ancient olive presses and arrived at a quaint little chapel looking out over the sea. What a blessing to celebrate Mass on this holy ground. I offered up my Mass for all of you and for all your intentions, including those of you who are sick, those who have lost loved ones, for our dear departed Cardinal John Patrick Foley and for our entire CNEWA family. Following Mass we headed for Haifa, a seaport city that appeared more modern, despite having suffered damage from the 2006 Israel-Hezbollah war. Our first stop was the office of Archbishop Elias Chacour, the Melkite Greek Catholic Archbishop of Akko, Haifa, Nazareth and Galilee. I had met Archbishop Chacour in Canada in October, so I was coming to meet a friend – and he certainly welcomed us as such. Twice nominated for the Nobel Peace Prize, he is a man who speaks openly and honestly and has written a number of books. Many consider him prophetic. He charmed us with many stories, some sad and others amusing. He told us of how he had hosted a group of 1,900 pilgrims from Paris and made provisions for all of them (48 busloads) to be welcomed into the homes of his parishes. He told the cardinal archbishop who arranged the pilgrimage that if they really wanted the experience of a pilgrim in the land of Jesus, then they should live where he lived and walked. He also spoke warmly of the visit of our own Michael La Civita, who last year brought a group of Catholic journalists to this region and met with Archbishop Chacour. I’m sure these journalists enjoyed their visit as much as I. He really wanted to accompany us to see some of his projects — especially in education — but we had to decline, as our day was full of other scheduled visits. We asked for his blessing and I promised to come back so that he might show me more of his diocese (or eparchy, as it is called in the Eastern churches). From his office we drove to the Maison du Sacre Coeur. This is a cherished Catholic institution that serves the needs of specially challenged children of all ages — even up to their early 20’s. Sister Katherina Fuchs, the Austrian-born Daughter of Charity who directs the facility, welcomed us and introduced us to three other sisters, who came from Lebanon and Spain. This dedicated group of sisters, followers of St. Vincent de Paul, offer tender, loving care to these very special children. I was particularly moved while watching the level of care with which some physical therapists worked, massaging the muscles of these special needs kids. Through a delicate series of respiratory heaves and hos, they were able to extract from them the desired cough that would help to clear their lungs. The sisters shared with us how their main mission was to help the Christians to feel secure in troubled times. Father Guido and I were honored to give them a blessing and to assure them of our continuing prayers. From the facility for specials needs children we went to a nearby facility called the House of Grace, originally founded by Mr. Kamil Shehadeh and his wife, Agnes, as a “home” to welcome prisoners who had recently finished serving their time. At first, the idea did not go over well with authorities and neighbors, but the determination of this grace-filled couple and eventually all five of their children has proven to be a jewel in the eyes of the entire country. Today the house is truly a home, as those participating in the myriad of programs are all welcomed as family. There are currently 15 prisoners going through the program. There are also hundreds of families who participate in programs to improve their quality of life, programs for youth and social skills and educational programs that enhance the lives of many people. While there, we visited with some of the successful beneficiaries – former prisoners who not only have gone on to renew their lives in a responsible and productive way, but continue to come back to their “family” and offer their help to new “family members.” Mrs. Shehadeh and her son, Jamal, have kept the flame of faith and love alive, as they received it from husband and father. The couple single-handedly restored an ancient church — a forlorn building that once served as the Melkite Greek Catholic cathedral, located on their property — and have made it into effectively their “family” parish chapel. It is beautiful beyond words. Mrs. Shehadeh confided in us that in this church, especially in the celebration of the Divine Liturgy, she receives all her strength. We had a terrific lunch with our newest family members in Haifa and thanked them for the great example of living the Gospel to the fullest. With difficulty, we stood up from the table and continued on our way. Next stop was another chapter of my pilgrimage as Father Guido led us to the House of Peter, where legend tells us that Jesus spent time growing up. There is considerable excavation still going on, as more and more articles of antiquity are being found year after year. One of the highlights was to walk through the synagogue where Jesus taught the elders. Looking at the stone seating along the sides of the ancient structure I could feel how dramatic it was for this young Jesus to be addressing these men learned in the law and steeped in tradition. From this venue we circled up a steep series of curves to the top of the Mount of the Beatitudes. Arriving on the mountaintop, there was a heavenly view of Galilee down below. This holy site is now blessed with a beautiful church, a guest house, retreat center and a convent. Standing there, I experienced such a feeling of tranquility. Just imagine looking down below and seeing the multitudes listening to Jesus. Pope John Paul II visited the Mount of Beatitudes and celebrated Mass just under a mile from here, on top of another hill below the property of the Domus Galilee, which is a guest house, retreat center and seminary of the Neo-Catechumenate. Can you imagine the excitement of attending that Mass at that venue? Light was giving way to darkness, so we made a final push to see the ruins of Chorazin, an ancient city castigated by our Lord for not repenting that has recently been excavated and shows the evidence of destruction. Well, that’s my tale of a power-packed first full day in Galilee. On Sunday, after a hardy breakfast at the German Pilgerhaus, we departed for Jerusalem, with some special stops and visits in between. On the road to Nazareth, over some pretty high hills — almost mountains — I found it rather unusual to see a sign posted on an overlook that stated that we were presently exactly at sea level. I have heard how low the elevations are in the Jordan Valley and how the Dead Sea is the lowest dry point on Earth, but it all sunk in when I saw that sign. How strange to be on a “mountaintop” and to know I was actually at sea level. Just another fascinating part of the pilgrimage for me. On to Nazareth. Our first stop was a tour of the Basilica of the Annunciation. The main church is built over the actual site of the Annunciation, where we would later celebrate Mass with the pastor and his flock. The church is very modern and has some dazzling mosaics of Mary, as depicted in the styles of the local cultures of many countries. The Japanese and Mexican mosaics were particularly impressive. We proceeded to visit the ancient crypt church, which sits immediately over the excavated remains of the spot where the Angel Gabriel appeared to Mary. It was a wonderful moment of meditation for me, to be at this venue and to see the significance of Mary’s acceptance of her role rendered in such beautiful artwork. From the crypt church, we walked only about 50 yards to the Church of St. Joseph, where, legend has it, St. Joseph lived. Again the main church is built over the excavated ruins of this dwelling. Here, you can really get close to the remnant of the house and even get a feel of life in that time. I have to mention, I really admire the Franciscan Custody of the Holy Land, which is charged with caring for many of these important treasures. Until this pastoral visit, I did not appreciate the importance or the vastness of this responsibility. The Franciscans do a tremendous job, as only they can, in welcoming pilgrims and serving their every need. Please remember them in your prayers, as their work is filled with many delicate challenges. They are on the front lines in preserving the Christian heritage of the holy places and the dignity and identity of Christians in this part of the world. The high point of the morning visit was an invitation to concelebrate the parish Sunday Mass in the basilica. And how satisfying it was to have the Gospel story about the Annunciation read over the very spot where it happened. And, of course, even though the Mass was in Arabic, I remembered all of you in my Mass intentions and all your loved ones. During the liturgy, there were nine servers, boys and girls, between the ages of 6 and 13. The two 6-year-olds did not really know how to kneel, but there were in awe to be on the altar, with their eyes wide open and fixed on the “older servers.” How this brought back memories of my earliest days as a server. After Mass we walked about one block to the humble abode of the patriarchal vicar of Israel, Bishop Boulos Marcuzzo. We were warmly welcomed by the vicar and he invited us to join him for some coffee and homemade cookies, baked by his staff of Polish Sisters of the Holy Family of Nazareth. By the way, the sisters were pleasantly surprised to learn that I am a good friend of their recent mother general, who is a Pittsburgher like myself. The bishop was an erudite delight, sharing his great knowledge and wisdom about his challenges as vicar in supporting the needs of the Christians in Israel. His own background is very interesting — he was born in Italy and as a child moved to the Holy Land and has been there ever since. He was ordained for the Latin Patriarchate in Jerusalem, which extends through Israel, Palestine, Jordan and Cyprus. He has invited me to return another time to visit with him some of the Latin parishes. I accepted his kind offer and look forward to that opportunity. After this visit, we proceeded to Jerusalem and arrived there in the mid-afternoon. Father Guido kindly routed us to some beautiful overlooks, including both sides of the Mount of Olives to garner some initial looks at this historical gem called Jerusalem. He pointed out so many sites and biblical references that, I must confess, there was too much to assimilate. Of course, during the next six days, there will be quality time, between pastoral visits, to see these venues firsthand. Father Guido and I have allotted one full day to visit prayerfully the 10 holy sites on his list. I’m looking forward to that. We arrived at the Notre Dame of Jerusalem Center, which is a pilgrim hotel, beautiful and comfortable. Sami will continue to be our host, as he was for the entire visit in Israel. Sami really knows the ins and outs of Israel and Palestine. He is well known, especially in circles of higher learning, having worked at Bethlehem University for many years before joining CNEWA and the Pontifical Mission as our regional director. To close, I share with you a private moment I had with someone special at the Basilica of the Annunciation in Nazareth. I left a special intention with Mary, the mother of our Lord, asking her to remember all of you to her Son. Tourists visit St. George’s Orthodox Church with its mosaic map of Palestine. Today marks the last full day of our pastoral visit to Jordan, as tomorrow in the mid-morning we will conclude with a final visit with the Franciscan Sisters of Mary, who work with Iraqi refugee families, some of whom we will meet. We arrived in Amman last night, exhausted from our travels through Petra. This morning, after a good night’s rest, we departed for Our Lady of Peace Center, which is located about 30 minutes outside the city of Amman in an agricultural area that shows signs of some development in the future, according to Ra’ed Bahou, our regional director for Jordan and Iraq. We were warmly greeted by the founder of this facility, Bishop Selim Sayegh, Latin Patriarchal Vicar in Jordan and the spiritual and moral personality associated with this facility. Our Lady of Peace offers many programs for mentally and physically handicapped youths. Since the center opened in 2004, it has become the anchor facility for a host of satellite programs and other mini-institutions. The bishop escorted us inside to meet Sister Adriana Biollo, the director of the center and the obvious driving force that makes everything happen. Of course, we had the usual Arabic coffee ritual, as every Jordanian would typically offer to visitors. Then it was on to the hall for a special Christmas show performed by a group of very special children. They presented a number of musical songs sung with great enthusiasm and some delightful dances, complete with big smiles and even a few winks for yours truly. I was able to get some wonderful candid photos of the kids, just enjoying themselves as they entertained. And a big highlight for them and for us was a visit from Santa Claus. The kids went wild when he came into the room, especially when the sisters approached with some big boxes of gifts. Each child came forward and received a gift. The children loved the attention, gifts and Santa, but they really loved Bishop Selim. In fact, the love that Bishop Selim Sayegh has for these special children cannot be contained. He smiles from ear to ear in their presence and many freely run to him to receive a big hug from him. This center has been a dream of his and now, as he approaches retirement after having served more than 30 years as vicar, he can enjoy the fruits of his labors, as reflected in the smiles of these precious little ones. Next stop was a special visit to Mt. Nebo. I have to tell you, this was an emotional experience, not just because of the panoramic view of the Jordan Valley below, but just the overwhelming reality that I was for the first time sharing a glimpse of the Promised Land as shown to Moses. This is the real deal, this is my faith being excited, live and in person. Welcome to the Promised Land! I spent some precious moments just taking it all in and trying to capture the fullness of this mini-recollection. The church on the mountaintop is being renovated, so we viewed some archeological remnants of the original discoveries of this Byzantine treasure. I was delighted to see a plaque in front of an olive tree planted by Pope John Paul. Here again, it reminded me of how holy is this ground. Wow. On to Madaba, a charming city that has a very dynamic yet ancient feel to it: Byzantine mosaics and ruins surround you, including the famous church of St. George, which houses the oldest map of the Holy Land and the Holy City of Jerusalem. Refounded by a priest in the 19th century, Madaba has a large Christian community, which is rare in the Hashemite Kingdom, with a vibrant spirit of brotherhood amongst all the churches and Muslims. A leading figure in much was our host Archimandrite Innokentios, a priest of the Greek Orthodox Patriarchate of Jerusalem who heads the school system in Jordan for the Orthodox Church. His affable personality has obviously motivated many people to support his numerous efforts to educate the young. As he says eloquently, the future of the Christians in Jordan — and in the Middle East — is through good education. The archimandrite also showed us a lovely center that can house about 100 pilgrims, many of whom come to the area to see Mt. Nebo and to study the mosaics that lie throughout modern Madaba, including that famous map. The pastor of the parish of St. George and his wife invited us for a wonderful lunch in their home. Bountiful does not quite describe the display of food on the table. They were the most attentive hosts and as I was tutored by Ra’ed, a host will not take “no” for an answer very easily. In this part of the world, you must decline requests for more food about three times to stop the flow of food. Both Father Guido and I learned so much from the archimandrite, who is very learned in church and civil law, in the culture of Jordan and the political and religious realities of life in this country. We closed the day by visiting our staff in New York (about 55 employees) through the wonder of Internet and video conferencing. For Father Guido, Ra’ed and me, we were excited to share with our family in New York some of the joys and uplifting experiences of our time with our family in Jordan. So tomorrow we will move on the third and final part of our pastoral visit, as we enter into Palestine and Israel, where we will meet our host and regional director, Sami El-Yousef. By the way, please know that as I had my best private moment on top of Mt. Nebo, I remembered all the CNEWA family in a brief prayer. You were with me when I saw the Promised Land. I forgot to mention in my blog post the other day that I had a wonderful visit on Monday afternoon to CNEWA’s Pontifical Mission Library in Amman. This multipurpose facility serves many age groups and many needs and is run by a most devoted corps of Teresians, a secular institute, and many volunteers. The team does everything — from catechetics to English classes, study hall opportunities to the provision of audio-visual materials in English, Arabic, French and Spanish offering study materials in theology, philosophy and culture. This project is subsidized by CNEWA and makes us proud of how many people pass through its doors. Today, Father Guido and I are in Petra, where we are scheduled to visit the marvelous ruins of Nabataean Petra, one of the wonders of the world. Yesterday, however, as we left Amman we headed south to the city of Kerak. This is a large city with a very small Christian population (Christians only make up 6 percent of the kingdom’s population). Our first stop was to the Italian Hospital, which is run by the Comboni Sisters. They have been here for 75 years and have decided to concentrate their resources and personnel at this hospital, since the city has so many poor and almost no Christian presence. The hospital very recently welcomed a new administrator, Sister Adele Brambilla, C.M.S., who has just returned to Jordan after finishing two terms as the worldwide head of the Comboni Sisters. She and the other four sisters in the community welcomed us with open arms (and the usual coffee and baked goods) and took us on a tour of this aging facility. Although there are some very new high tech pieces of equipment, the hospital is badly in need of a complete makeover. There is a new wing under construction and the sisters express their hope that God will allow them to bring the renovations to fruition. While visiting in the nursery, I was escorted by an older Italian nun with real charm and a mischievous smile. She pointed out to me the crèche next to the babies in incubators. I showed my surprise at seeing the crèche in the nursery, and she said: “Why not? What better place to have a crèche than here with the babies.” That sure makes sense to me. By the way, I couldn’t help but notice three Muslim nurses decorating a Christmas tree and putting up some religious symbols for Christmas. The sisters commented that the spirit of acceptance among the Christians and Muslims at the hospital — and in this city in general — was such that they had great respect for each other in the practice of the faith. This mutual respect, I understand, is not unusual in Jordan and it underlines the importance of the sisters being present in Kerak. Their presence as ambassadors of Christ is even more important than the wonderful health care they provide the poor. The sisters expressed to all of you their gratitude for the help given by CNEWA and ask for your continuing prayers. From the hospital we went to visit the Melkite Greek Catholic pastor of Immaculate Conception Church, Abuna Boulos (or Father Paul), and were joined there by Archbishop Yasser Ayyash and some other priests. We had a delightful lunch, where I learned much about the Melkite Greek Catholic Church. When I entered the rectory, Father Boulos immediately introduced me to his wife, as it is the Melkite tradition for priests to marry before ordination. After a brief visit to the church, which is finishing up a major restoration project sponsored by CNEWA, we headed for the Bedouin village of Smakieh for the highlight of the day and the spiritual highlight of this pastoral visit thus far. The village of Smakieh is entirely Christian, which is rare in this Muslim kingdom. There are only two families of Bedouin living in the village, the Latin Hijazine family and the Melkite Akasheh family. Between these two families they have offered 14 priests in service to the church. Added to this are the number of Catholic and Orthodox priests that have come from neighboring Bedouin towns, such as Raba and Ader, who basically supplied much of the entire presbyterate for Jordan and Israel and Palestine. God is good all the time and all the time God is good. From the spiritually charged experience in this Bedouin village in southern Jordan we drove about three hours to the famous ancient treasure of Petra. I will send you my next update on Thursday, which will offer you a glimpse of Petra, and much more. You were all remembered at that ordination Eucharist, and not just by Father Guido and me, but by the parish family in Smakieh. Their prayers carry at least double points in heaven. Watch the video below of our visit with Bedouin Christians.